Toast is a breakfast staple in any household, which is why it is worthwhile to invest in a good-quality toaster. After all, if you are going to be using it day in and day out, you might as well make sure that you are getting a prime toaster. That being said, it isn’t all that easy to choose the best toaster, especially considering the number of options you have to wade through. This can be incredibly trying, considering that you have to find a toaster that affords you lots of toasting options, is consistent with its browning and is long-lasting. Well, you don’t have to worry about this time-consuming process any longer since we decided to make this a lot easier for you. Here, you will find a list of the best brands and models on the market. What’s more, we’ve also added a buying guide as a bonus! Making toast for more than one person at a time can be tricky because each person likes their toast a certain way. What’s great about this Cuisinart toaster is that it makes sure that everyone gets what they want. This four-slice toaster has dual control panels. This means that you can have two different settings for each side of the toaster. There are 6 timing settings to ensure that you can find the perfect positioning for lightly brown, medium toasted, or well-toasted slices of bread. The only thing to be wary of the dials is that they are incredibly sensitive and even the slightest movement can cause them to shift. 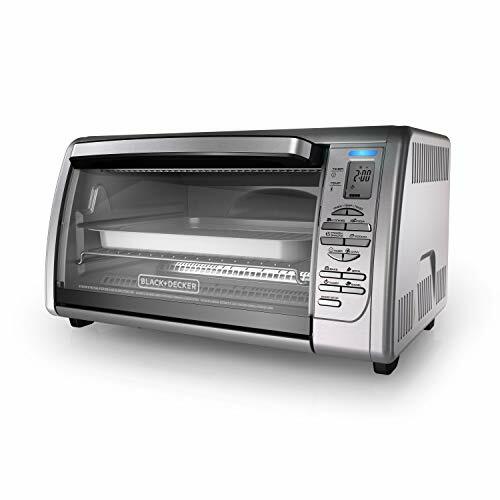 This model also has three heating and toasting options – bagel, defrost and reheat. The defrost function allows the bread to first be thawed before it is browned to your desired shade. The reheat, on the other hand, allows you to heat up the bread without browning it. With the bagel setting, you get to enjoy a bagel that is toasty on the top and chewy on the bottom – just like you would get in a deli! Yet another interesting feature on this toaster is the high-lift lever which gives those smaller pieces of bread an additional boost. The toaster is also really easy to clean up since it comes with a crumb tray that you can slide out and clean out. For the most part, this really is a great toaster. The only design flaw being the cord, which is a bit short and can be difficult to use in certain kitchens. Now, there is no denying that there is quite a price tag attached to this toaster. The payoff, however, is that you get to enjoy a lot of functions, many of which aren’t available with most other toasters. 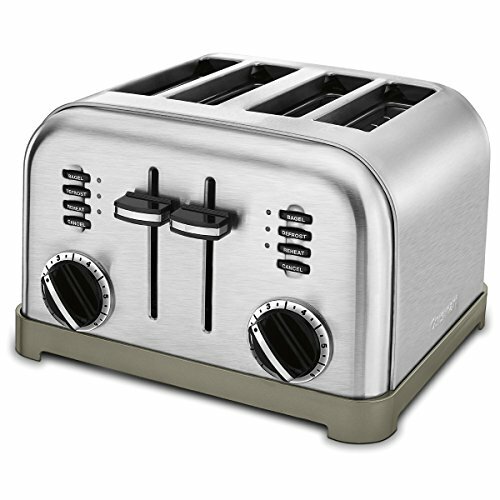 This is another four-slice toaster, where you get dual independent toast controls. So, each side of the toaster can be controlled separately. Also, unlike old-fashioned dials and awkward switches, this toaster features push-button controls that elicit an immediate response. 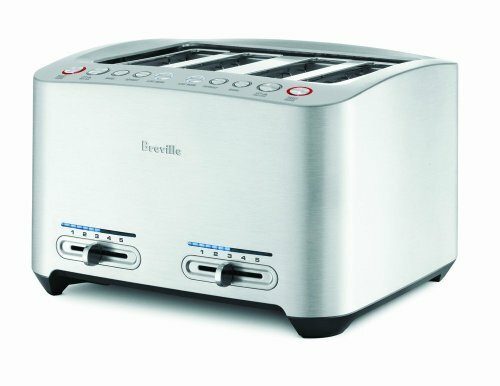 The Breville toaster provides you with three different toasting options – regular toast feature, bagel, and ‘a bit more’. The first two controls can be found with most toasters and allow you to toast the bread just the way you like. The ‘a bit more’ function, though, takes this to the next level. See, if you don’t feel like your bread is toasted enough and only want it browned just a tad more, this is the button to use. In case that wasn’t enough, the toaster is equipped with a ‘lift and look’ option as well. This lets you take a peek at your bread before the toasting cycle is complete so that you can adjust the settings accordingly. You can clean up the toaster easily too since there is a removable crumb tray at the bottom. The only unfortunate thing about this toaster is that one side of your bread will almost always ends up being a bit more toasted than the other. While this may not be that bad, it can be a bit annoying. If you are looking for a more compact toaster, then this Oster toaster will serve you well. However, despite just having two slots, they are extra-wide and more accommodating for thicker slices of bread. This isn’t just all, though. This appliance has dual, auto-adjusting bread guides. This means that it adjusts itself according to the thickness of each slice of bread, ensuring that the slices are toasted to perfection each time. The only real downside with these slots is that they aren’t too deep. So, if you are using really long slices of bread, you may find that the topmost portion is left untoasted. However, it does work really well with small pieces of bread. The high-rise lever lifts the bread up so that you can take it out more easily. There is also an anti-jamming mechanism included in the design which prevents the slices from getting stuck in the toaster. This toaster has seven toasting shades, which means that it is a lot easier for you to get the precise level of toastiness that you are after. The toaster similarly has four different toasting options including toast, bagel, frozen, and warm. So, you get to place a variety of bread items in this appliance such as English muffins, bagels, and frozen waffles. Last but not least, the appliance is equipped with a crumb tray that makes cleanup afterward an absolute breeze. 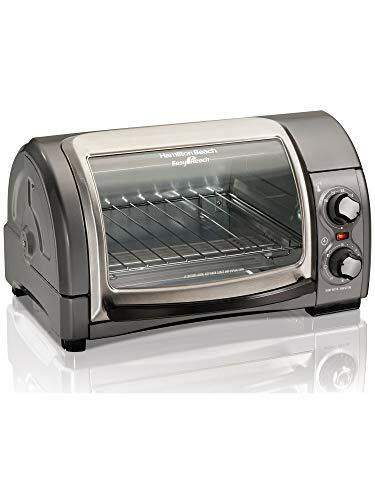 If you want a toaster that has multi-function features, then you may want to consider investing in a toaster oven such as this. Now, one of the things that set this particular toaster oven apart from the rest is that it has a roll top door. This allows you to get easier access to your toast. Speaking of which, you can fit up to four slices of toast on the racks, depending of course, on the type of bread that you are using. The good news is that if you want to toast longer slices of bread, you can ensure that every inch of the bread will be toasted properly. All of the slices toast equally well and come out with the same shade as well as crunch. It will, however, take you longer to make toast in this appliance than with a toaster. When making toast in the toaster oven, you need to adjust the temperature on the temperature dial– there is a specific temperature for toast. The dial below that lets you choose the shade of toast that you would like. All this means that it is a tad bit more complicated to make toast in an appliance such as this. Nonetheless, one of the perks afforded by a toaster oven is that you can add toppings to the bread either before or while it is toasting. What’s more, you can see your toast the entire time, so that you know the precise moment that you should take it off. There is also a crumb tray to make cleaning up the oven a lot easier to manage. This toaster oven is ideal for anyone who wants to make larger batches of toast. Unlike many toasters and even some toaster ovens, this appliance allows you to make six slices of toast. So, this is great for large families. It is also a good feature if you want to use longer slices of bread and still have them toasted properly. The only issue with this is that the oven also takes up more counter space as a result. The advantage with this toaster oven is that it actually toasts the bread really well. Each of the slices come out evenly toasted every time. This is because there is a designated toast function on the toaster oven. At the same time, there is a digital timer and temperature setting that makes it easier to find your ideal option. Not to mention, these features make the oven a lot simpler to use as well. Yet another benefit is that you can see your toast browning, which gives you an idea of when to take the bread out. Now, when you are handling this toaster oven, you should be careful. The entire appliance has a tendency to get rather hot so it can be dangerous. Also, as with all toaster ovens, it does take longer to make the toast compared to traditional designs. There is, however, a crumb tray to make cleaning out the oven a bit easier. There are essentially two types of toasters – pop-up toasters and countertop toaster ovens. These appliances are specifically designed to toast bread. They either have 2-slice or 4-slice slots. This kind of toaster can also be used to warm or toast bagels, frozen waffles, and similar items. There are quite a few advantages to utilizing this type of toaster. To start with, since these toasters are designed to be used for toasting purposes, they are incredibly simple to use. With the push of a few buttons, you will be able to have your toast just the way you like it. They are also compact and rather affordable to boot. Not to mention, making toast in these models is incredibly quick, often just taking a couple of minutes. At the same time, they do have some flaws. For one thing, you can’t make more than four slices at a time. It can also be difficult to toast thick or long slices of bread evenly in these appliances. So, the alternative is the toaster oven. 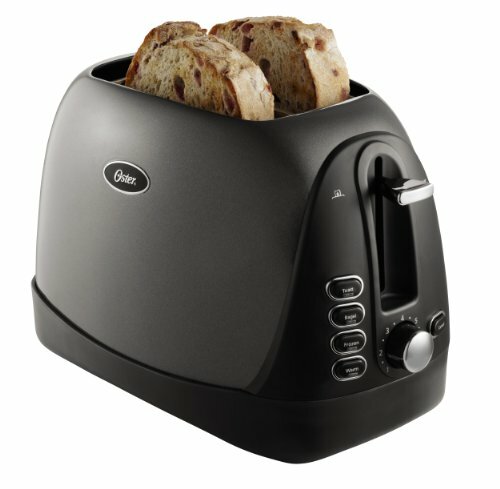 Now, the top benefit of this kind of toaster is that you can even use it to bake and roast, in addition to making toast. Not to mention, you can also usually make more slices of toast at the same time. This does mean, however, that these toasters take up more counter space than the traditional models. Still, you do get to add toppings to the bread while it is toasting and can also see the bread at all times, ensuring that it is browned to perfection. The unfortunate thing about toaster ovens is that they can be a bit tricky to use, especially if you are not familiar with how they work. This can complicate your toast-making process. Also, there is the fact that it can take significantly more time and you will often have to keep an eye on your bread to make sure that it doesn’t burn. Now, if you are trying to figure out which model is best for you, then it really does depend on your situation. If you want an appliance that is quick and easy to use, then a toaster is what you need. In case you have a rather small kitchen, a toaster is a good option here too. On the other hand, if you want more control over how your toast is made, a toaster oven would better suit your purpose. One of the most complicated aspects of your toaster is the temperature and ‘shade’ settings. This is because not many people actually understand what all of those numbers mean. To add to this, there are actually different functions, depending on the toaster that you are using. Typically, if you are using a more expensive or high-quality toaster, the dial next to the temperature setting relates to time. So, those numbers (often one to six) refer to the minutes that your bread will toast for. With the cheaper toasters, though, the temperature cuts out when a specific voltage is reached. The toast then pops out at this time. To learn what type of toaster you are considering, you should always look at the instruction manual to get a better idea. The next thing that you should look out for is consistency with your toaster or toaster oven. This means that each slice of bread should be toasted exactly the right shade. Not only should the slices have the same shade, they should be toasted equally on each side. To top it off, a good toaster or toaster oven should be capable of providing reliable results every time. This means that whenever you set a particular temperature or setting, you are absolutely certain what your bread is going to look like at the end of the process. Since you probably want to toast more than just bread, you should also look at the other things that your toaster can do. For one thing, it should have a ‘defrost’ or ‘frozen’ function. This way, the toaster will automatically thaw out any frozen bread before it begins to toast it. Another feature to look for is the ‘bagel’ function. This allows you to heat your bagel differently. This feature ensures that the bagel is provided with more heat so that it is toasted more thoroughly. At the same time, it also only toasts the inner portion of the bagel, keeping the top and bottom soft. Then, there is the matter of slot width and length. Most people prefer getting a toaster with wider slots. This allows them to toast a wide variety of breads as a result. Of course, this is only an effective solution, if the guides on the toaster can be adjusted as well. Otherwise, your slice of bread will lean to one side, getting more browned in that area than the other. Now, if you tend to use longer slices of bread, then you need slots that are a bit deeper so that the entire slice can be fitted into the appliance. At the same time, one of the biggest drawbacks of a toaster is having the smaller slices getting stuck inside. So, you should consider a toaster with a high-lift lever that will boost these smaller slices up. Crumb Tray: you should always look for a removable crumb tray as this makes cleaning out your toaster a lot easier. Dual toasting options: for a toaster with four-slice slots, you may want to consider dual settings. This way, you can toast each side at different temperatures and get separate results. Durability: the toaster should be made from high-quality materials so that you can ensure that it will last longer. Stainless steel and similar materials are often a good option. Precise controls: always look for buttons and dials that allow you to be precise when choosing your settings. This is the only way to make sure that the toast comes out exactly the way you like it. So, when choosing a toaster, you will need to focus on type, the various temperatures and toasting options, consistency, slot size, and more. All these features will allow you to find the best toaster for you and your kitchen. Now, if you are looking for a budget-friendly toaster, the Oster Toaster will help you save some serious cash. On the other hand, if you prefer a larger number of functions over price, then the Breville Toaster is for you. The Cuisinart Toaster offers just as many functions but with more temperature options to choose from. If you prefer toaster ovens instead of toasters, then both Hamilton Beach and Black & Decker are high-quality options. Now all that is left for you is to pick a toaster that will provide you with delicious, perfectly-toasted bread.